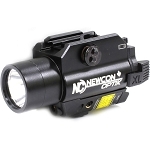 Gain tactical advantage in close quarter combat or training with the NCFL 9G LED Illuminator & Laser Aimer. 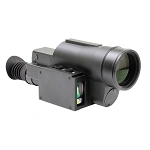 This compact illumination and aiming system is compatible with a wide variety of firearms, ranging from handguns to assault rifles, and can be quickly attached via its Picatinny rail mount. 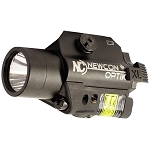 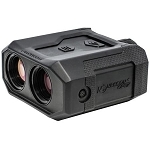 It provides you with a bright, wide angle white illumination beam from its 225-lumen Cree Q5 LED and offers a bright green laser for taking a quick and precise aim at your targets. 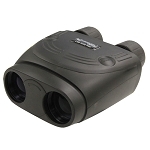 The system is powered by two lithium CR-123 batteries and offers a runtime of 5 hours. Weighing only 5 oz with the batteries, the illuminator also features a durable high quality aluminum housing with a matte black finish.